Last week Year 6 pupils from Peterhouse Primary School visited us for a session looking at local soldiers in the First World War. We started the session with a general introduction to archives by playing the indenture game. Next the pupils split into 2 groups. One group visited our strongrooms to see where we keep our documents, before looking at the Norfolk in the First World exhibition. The other group had a look at some original documents, relating to Great Yarmouth in the First World War, including the diary of Judith Ferrier, the plans for Great Yarmouth War Memorial (both the proposed plan by Lutyens and the approved plan), a list of soldiers to be included in the war memorial and a letter about Zeppelin Raids. For the afternoon session, the pupils really concentrated on researching people from their war memorial. They looked at a 1901 and 1911 census return, the war medal card and the certificate from the Commonwealth War Graves Commission website. These documents helped the pupils to find out about the soldiers’ lives before the war, their involvement in the war and how and when they died. 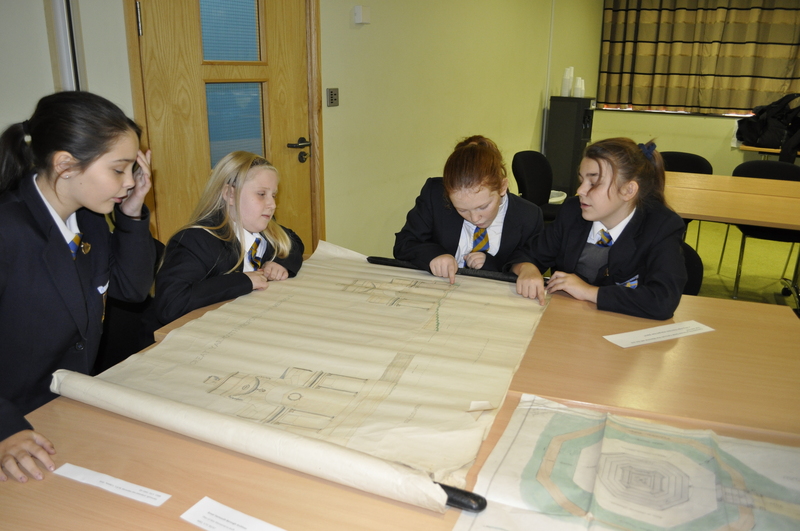 Pupils compare the plans for the proposed War Memorial with the one that was actually built. This entry was posted in Events, Schools and tagged census, Commonwealth War Graves Commission, diary, First World War, great yarmouth, Great Yarmouth War Memorial, Judith Ferrier, Peterhouse Primary School. Bookmark the permalink.